I had the opportunity to test the latest pattern in the Sew Mojo series (#2) this last week. Thanks Suzy! If you haven't already, go check out the pattern listing that shows multiple variations and colorways of this pattern. I have the wall space in my house already picked out to hang this series when complete, and I knew I wanted to use the same color palette for the second mini as I did the first. In fact, I used many of the same exact fabrics which should make for a very cohesive look in the end. The emphasis is on composition in this second pattern exercise. Having next to no art training, I appreciated this mini lesson as it applies to quilting. Part of that creative impulse was to echo a design element of the first mini (above, left) in the second mini (above, right). Whereas the shorter wonky strips were going vertically along the side of the first mini, I wanted to play off of that idea and add wonky strips going across the top of the second mini. 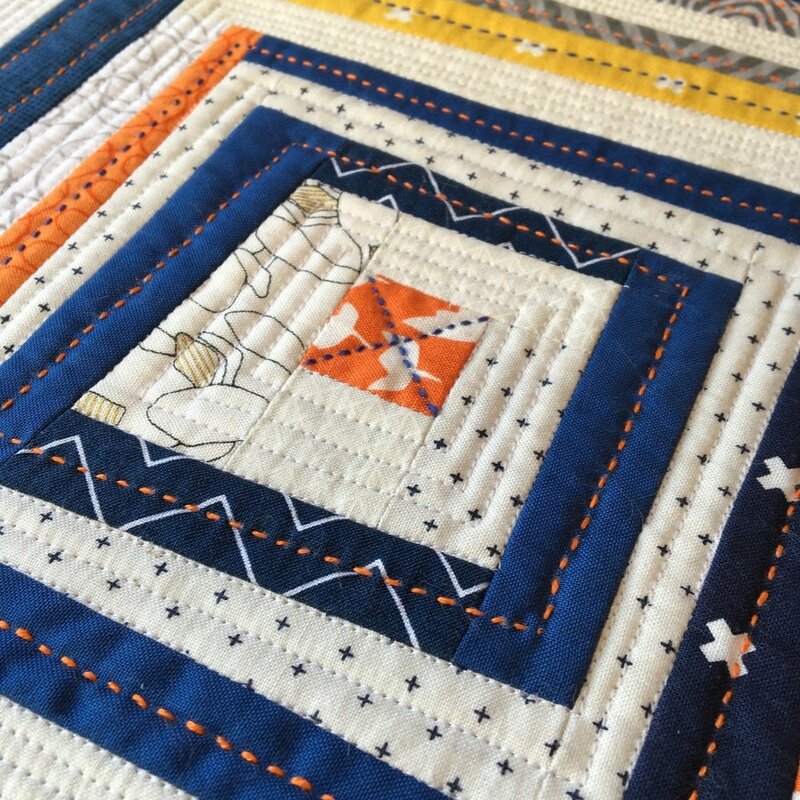 Ultimately, I wanted the focus of the piece to remain with the orange center square, so in order to minimize the boldness of the strips along the top, I added matchstick quilting to those areas to unify that space and to downplay it. In the areas where I added hand quilting, I marked my lines using a very faint white marking pencil by Sewline. I have an ever-growing list of tools that I use and personally vouch for, you'll find the details of the marking pencil included. In keeping with the style of the first mini, I used machine quilted lines in the "background" areas and hand stitching in the foreground fabrics. What can I say? Always perfectly imperfect! I hope that you'll give Sew Mojo #2 a try! It's an absolute blast to work out your creativity muscles, learn a new approach to design, and have a finished piece of art in the end!